The What: Renkus-Heinz is now shipping new Dante-enabled versions of the ICONYX Gen5 and IC Live for fixed installation. Iconyx IC Series and IC Live ICL-F Series models are now available in -RD versions, offering Dual Redundant Dante connectivity with audio transport and configurable sample rates up to 96kHz. The What Else: Concurrently, Renkus-Heinz has announced the release of RHAON 2.1, a major update to the company's RHAON II software, now with support for Dante connectivity. The new v2.1 update of RHAON II (Renkus-Heinz Audio Operations Network) incorporates more than 100 software updates and enhancements, including support for multiple zones, as well as a new Device Icon View mode for organizing larger systems. System Status reports covering all device parameters can easily be generated, and copy/paste of DSP settings between different device types is also supported. "We're very excited to offer the addition of Dante into our Iconyx and IC Live products," said Ladd Temple, North American sales manager for Renkus-Heinz. "Dante has become the industry's go-to protocol for creating and maintaining a stable, user-friendly digital signal throughout an audio system. Compatible with any installation, from small churches and schools to international airports and stadia, Renkus-Heinz and Dante technology have combined to deliver the tools installers need to make their projects the most technologically advanced." Dante implementation is presently in the works as well for the company's multiple point-source and line array products. "Also currently in development is a fiber optic Dante option," Temple said. "This will give our customers even more flexibility and control, particularly with systems covering a very large area." 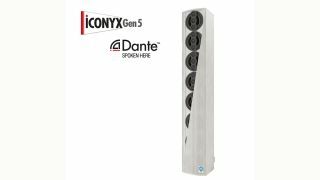 The Bottom Line: With built-in Dante connectivity, Renkus-Heinz’ popular ICONYX series has been made even more flexible, making it well suited for a variety of uses, from smaller rooms to the largest stadiums and facilities.